“I already had this [concept] on my mind but I didn’t know what it would become,” stated Program Director, Keisha “TK” Dutes after recapping what used her to embark on this creative endeavor that is a on-air and live reading of W.E.B. 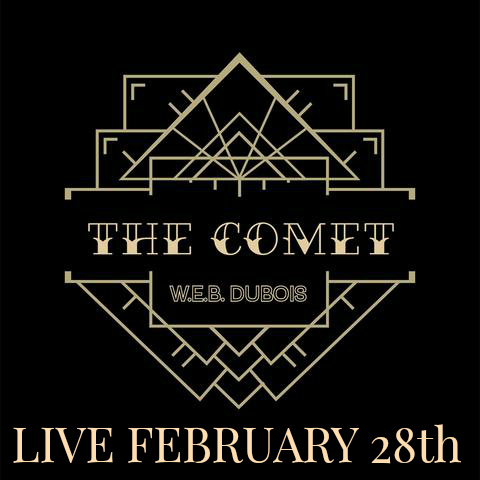 Dubois’ The Comet. The Comet is a 1920s science fiction short story, that explores the relationship between Jim Davis and Julia after a comet hits New York and unleashes toxic gases that kill everyone except them. Mr. Dubois layers his science fiction story by addressing the racial economic divide as Jim Davis is revealed to be a poor black man and Julia is revealed as a wealthy white women. This compelling story along with satisfying the need to have a diverse cast tell the story drove Dutes to use a predominantly non-white cast. Part 1: Welcome + “Air Tubman” Preview by Lacresha Berry. Part 3: Cast & Crew Q&A moderated by Marcus Dargan of Black Lives Arts Movement.